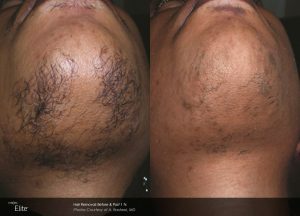 Excess unwanted hair is unsightly at best and, at worst, difficult to manage. Temporary removal techniques such as shaving, plucking, waxing, threading and depilatories are short lasting and high maintenance. Often times, they result in skin irritation, bumps, hyperpigmentation and scarring. In some cases, they can even cause or spread skin infections. For patients with darkly pigmented unwanted hair, laser hair removal is a long-term solution to an otherwise constant problem. Laser hair removal works by specifically targeting the pigment in the root of the hair. Once the laser energy is absorbed, the hair is permanently destroyed. For laser hair removal to be effective, hair must be darkly pigmented. Red, blonde, or white hairs are not seen by the laser and therefore will not respond. Any body area can be treated. After the skin is cleansed, the hair is shaved and a cool gel is applied. The laser feels like a warm rubber band snapping against the skin. Hairs vaporize during the treatment (which can smell!). Depending on the body surface area, the treatment can take anywhere from 1 minute for the upper lip to 30 minutes for a full back. Skin is cooled and a medicated lotion may be applied. Residual redness usually fades within a few hours. Over the following 2 weeks, hairs continue to come to the surface and drop out. Most patients require one session a month for 6-9 months to permanently reduce hair growth by approximately 80%. Since there are resting hairs, periodic touch ups are generally required. Laser hair removal is a relatively low risk procedure, when done by a dermatologist. Risks include blisters, burns, dark marks, light marks and scarring. To avoid complications, skin should not be sun tanned, spray tanned or self-tanned for at least 2 weeks prior to treatment. Patients with skin of color should only be treated with specific laser wavelengths that pass through the top layer of skin without affecting the pigment. Laser hair removal technology has advanced greatly over the years, becoming more efficient and less painful. It is safe in all skin types and results are long lasting. For those of us who have noticeable dark hair in all the wrong places and who spend a ton of time and money trying to stay ahead of it, laser hair removal is the life changing answer! Call Spring Street Dermatology at 212-431-4749 to get started.